Come all you rounders if you want to hear, a story about a brave engineer. Casey Jones was the rounder’s name. On a six-eight wheeler, boys, he won his fame. Exactly one-hundred-sixteen years ago, on April 30, 1900, the brave engineer mounted to his cabin and he took his farewell trip into the promised land. Casey Jones was born Jonathan Luther Jones in 1863. He got the nickname “Cayce” from his hometown in Kentucky, and he restyled it as “Casey”. Jones married Mary Brady in 1886 and raised three children. He worked for the M&O and the IC railroads, and eventually rose to his dream of being an engineer, becoming one of the most able and respected in the profession, famous for his unique sound with the train whistle. In 1893, Casey’s services were employed at the World’s Columbian Exposition in Chicago. On April 30, 1900, Casey Jones made his final run. It was a foggy night, and Casey departed in the Old 362, behind schedule at 12:50 am, pulling the No. 1. Despite several delays, Casey was able to get the train running on schedule for a time. The end of the run came for Casey, however, when his fireman Sim Webb spotted something on the tracks ahead. It was a stalled freight train. Casey slammed on his airbrakes, but it was too late, and the Old 362 plowed into the rear of the freight train, going through several cars before derailing. Thanks to his heroic actions that night, Casey’s life was the only loss in the accident. His story was immortalized in song by IC engine-wiper Wallace Saunders. Casey Jones went down in history as an American folk hero, he was a teetotaler, a family man, a baseball lover, and a brave engineer. Gennett 3005 was recorded March 24 and April 5, 1925 in Gennett’s New York studio. 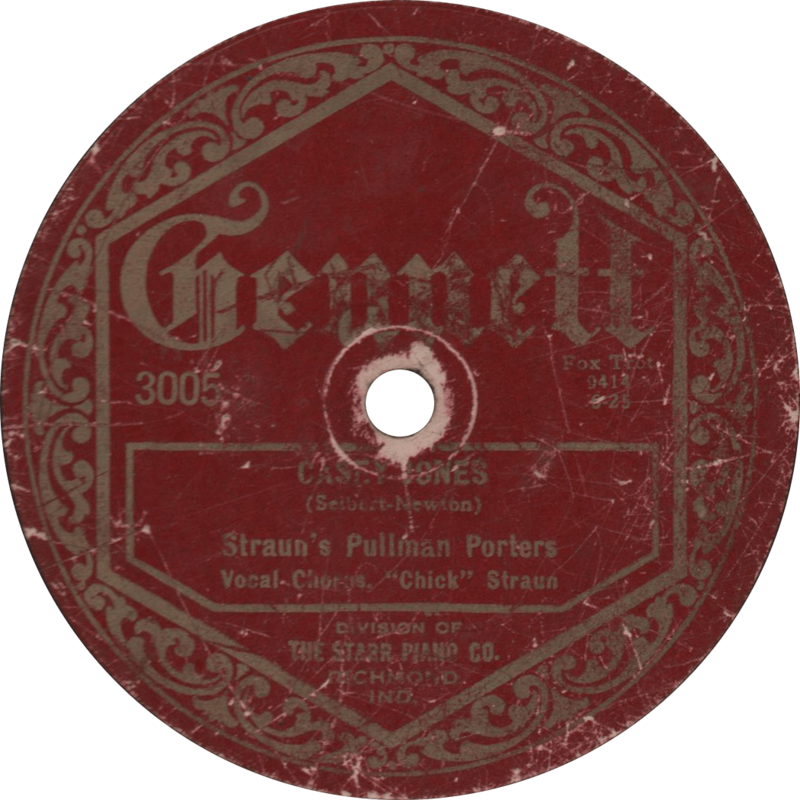 “Straun’s Pullman Porters” is a pseudonym for Nathan Glantz and his Orchestra, fronted by vocalist “Chick” Straun, apparently yet another a pseudonym, this time for Jack Kaufman. I’m not entirely sure what you’d call these old folk songs reworked as jazz, if there even is a name for them, but I know I like them. Much like Paul Tremaine’s hot dance renditions of “She’ll Be Comin ‘Round the Mountain” (and so forth), but these two are much earlier. The first song on this disc is Wallace Saunders’ famous tale of the brave engineer, “Casey Jones”, sung by “Chick” Straun/Jack Kaufman. Songwriting credit is given on the label to vaudevillians T. Lawrence Seibert and Eddie Newton, who popularized the song as a comedy act, with lyrics alleging infidelity on the part of Mrs. Jones, which she opposed for many years. I selected this version specifically to avoid those lines, in order to maintain some respect toward poor old Casey. Casey Jones, recorded March 24, 1925 by Straun’s Pullman Porters. Unfortunately for us, the old classic tune, “A Hot Time in the Old Town Tonight”, is marred by some skips, but it’s still a neat little side. 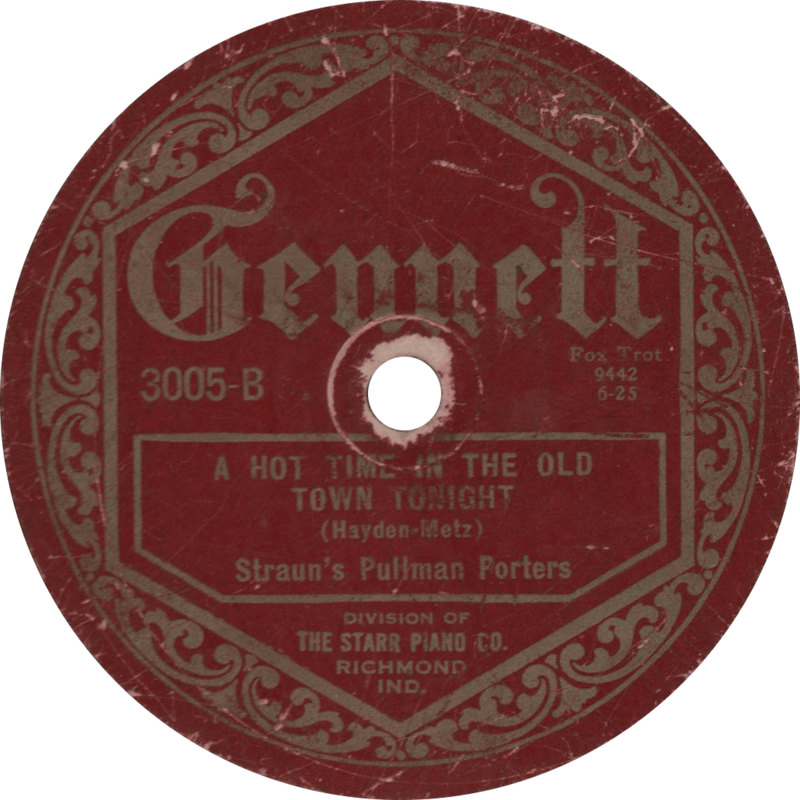 A Hot Time in the Old Town Tonight, recorded April 5, 1925 by Straun’s Pullman Porters. This entry was posted in Records and tagged 1920s, 1925, Casey Jones, Dance Band, Gennett, Jack Kaufman, Jazz, Nathan Glantz, New York, Railroad Song, Starr Piano Co., Wallace Saunders by R. Connor Montgomery. Bookmark the permalink.